Bearded irises are relatively easy garden plants to grow and will give good results with a minimum of care, but like all plants, the better the culture the more magnificent the display. The following instructions are easy to implement and should lead to beautiful iris blooms year after year. Irises require at least a half-day (6-8 hours) of direct sunlight. Some afternoon shade is beneficial in extremely hot climates, but in general irises do best in full sun. Iris will grow in deep shade, but probably not flower. Provide your irises with good drainage. A raised bed or planting on a slope are ideal places to plant iris. Good air circulation is essential and water should not stand in the beds. Bearded irises will thrive in most well drained soils. 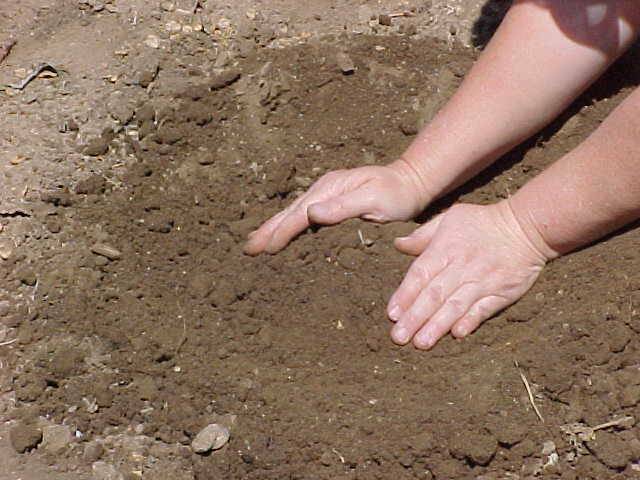 If you have heavy soil, adding humus - compost - or other organic material - will improve drainage. Gypsum is an excellent soil conditioner that can improve most clay soils. The ideal pH for irises is 6.8 (slightly acidic) but irises are quite tolerant of less-than-perfect soils. Lime may be added to acidic soils and sulfur may be added to alkaline soils. Have your soil tested before making any correction. Plant your rhizomes at or just barely below the surface of the ground. 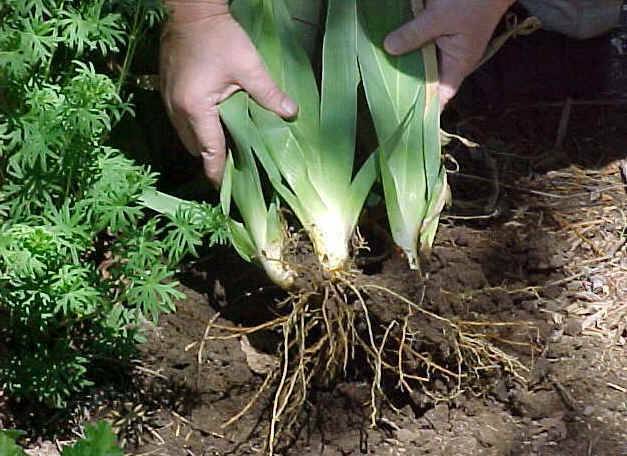 Irises should be planted so the tops of the rhizomes are visible and the roots are spread out facing downwards in the soil. However, in extremely hot climates or with very light soils, cover rhizomes with up to one inch of soil. Tamp the soil firmly to anchor the rhizomes until new roots begin to grow, and water well. It is a common mistake to plant Irises too deeply. Step (1) Build up a small mound of soil in the center of the planting hole. Step (2) Center the rhizome on the soil mound and spread out the roots on either side. Step (3) Firm the soil around the roots. Newly planted rhizomes should be watered thoroughly. Be Patient -- Irises are perennials and require time to grow. New growth may be noticeable within 2-3 weeks and begins with a new center leaf in the fan. Depending upon the maturity of the rhizome and the geographical location, there may not be blooms the first Spring. Build up a small mound of soil in the center of the planting hole. Center the rhizome on the soil mound and spread out the roots on either side. Firm the soil around the roots. Newly planted rhizomes should be watered thoroughly. Planting rhizomes 12 to 24 inches apart is the norm. Close planting results in immediate effect, faster clump formation, and more color but makes dividing clumps a necessity in two to three years. 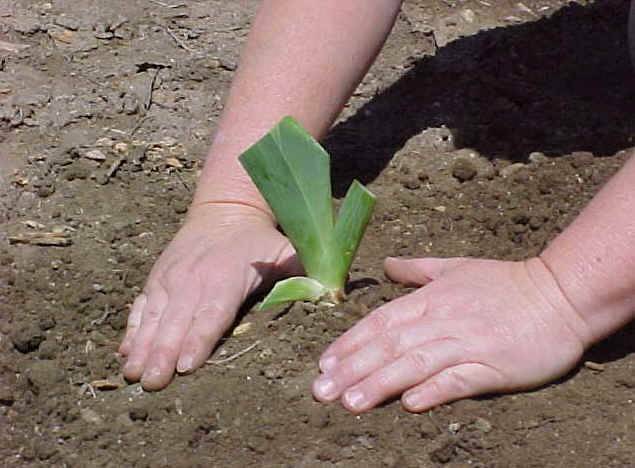 The photo to the below shows iris being planted in groups of three. Notice that each of the rhizome "toes" face inward towards each other about 8 inches apart as they are planted. Newly planted rhizomes need moisture so their root systems develop. Once established, irises usually do not need watering except in arid regions. 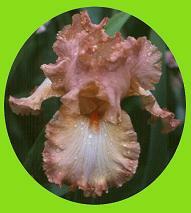 Over watering of Irises is a common mistake. After planting, water well and continue watering until the first good rain. If lack of rain persists, watering should be deep enough to penetrate the shallow root system. Deep watering on occasion is better than frequent shallow watering. The soil type for your area will determine your fertilizer needs. Superphosphate, or a well-balanced fertilizer with an N-P-K ratio of 5-10-10 or 5-5-10 are recommended. Avoid anything high in nitrogen as it encourages soft growth that is susceptible to disease. A light application in early spring and again a month after bloom is appreciated. 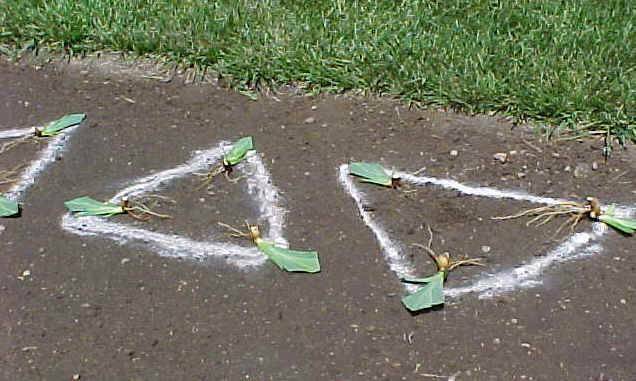 Place fertilizer around rhizomes, not directly on them. Alfalfa pellets (without salt) are extremely beneficial when incorporated in the soil around newly planted irises. Do NOT use Feed and Weed preparations. When irises become crowded, usually every three to four years, bloom will decline. At this time, old clumps may be thinned by removing several divisions and leaving a portion of the clump in the ground. 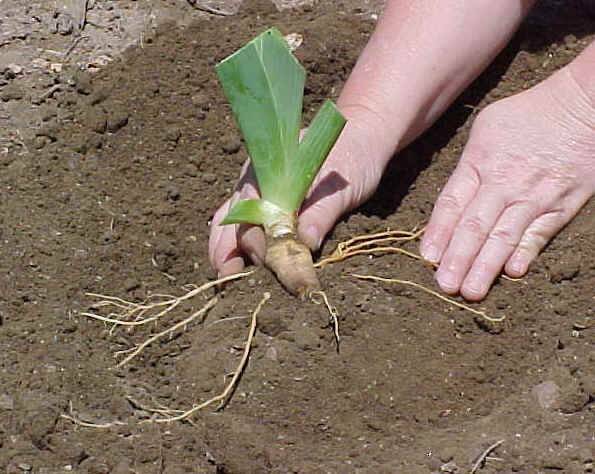 A better practice is to remove the entire clump, replenish the soil and replant a few large rhizomes. Digging a three year iris clump. Remove excess dirt and discard the old center divisions. 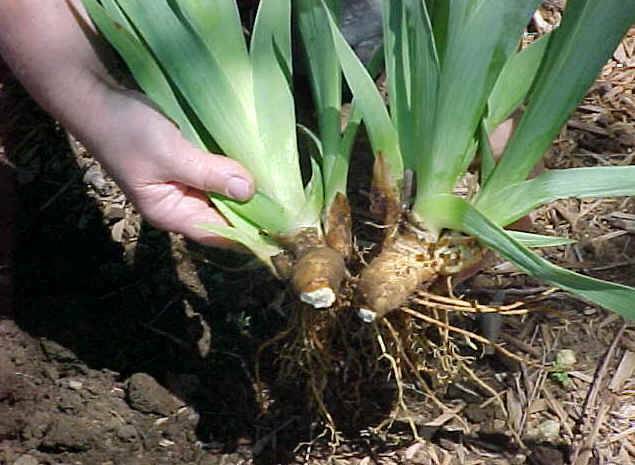 Separate the individual rhizomes for replanting. 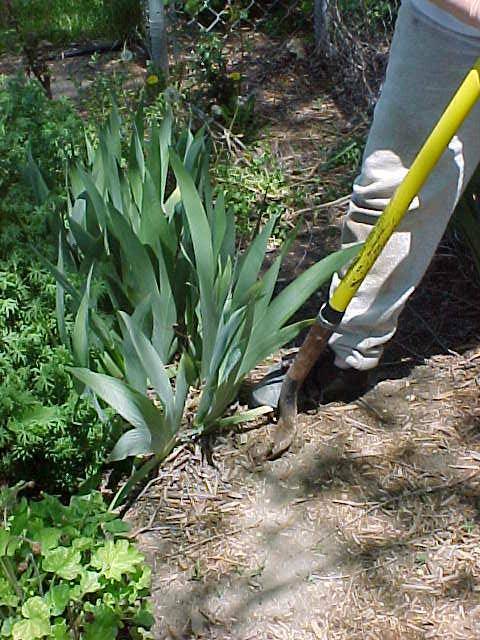 It is extremely important to keep your iris beds free of weeds and fallen leaves so the rhizomes may bask in the sun. Spacing plants so there is good air circulation will help prevent diseases. Break out bloomstalks as soon as bloom season is over. This prevents contamination of your named varieties by chance bee crosses. These crosses would cause seedpods to form that might go unnoticed. If given time to ripen, they might drop seeds to the ground. The resulting new plants are often unattractive. So breaking out bloomstalks right away is a good garden practice. Note: Much of the above planting information was derived from William Shear's book The Gardener's Iris Book published by The Taunton Press. Mr. Shear is a biologist at Hampden-Sydney College in Virginia. He has been growing irises for more than 50 years.